You can do your ALM Octane work directly from the IntelliJ IDEA IDE. 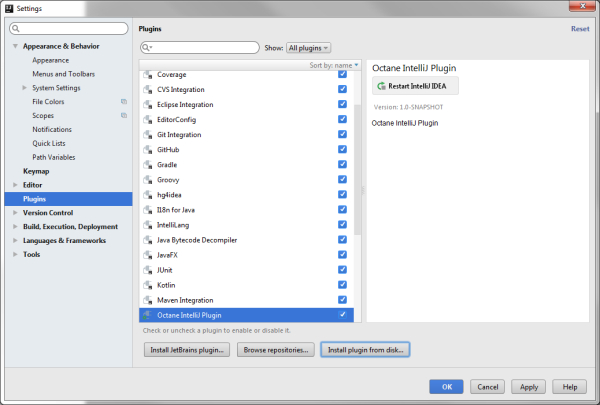 To do so, install the ALM Octane plugin for IntelliJ IDEA. Limitations: User-defined fields are not accessible from IntelliJ IDEA. The plugin is open source. To access the source code, see https://github.com/MicroFocus/octane-intellij-plugin. The plugin updates all data in the host IntelliJ IDEA application. 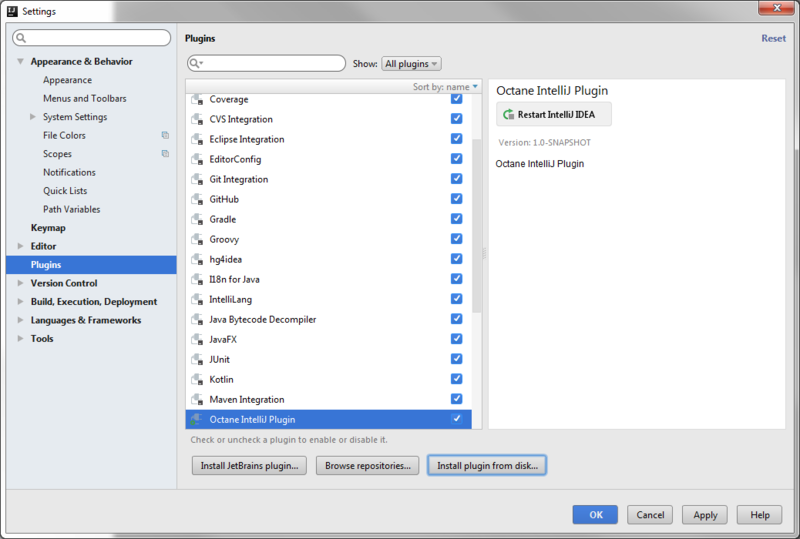 Changes made in the IntelliJ IDEA impact data in ALM Octane. Go to the JetBrains Plugins store: https://plugins.jetbrains.com/idea/plugin/9540-alm-octane. In IntelliJ IDEA, choose File -> Settings -> Plugins. Navigate to, and select, the zip file that you downloaded. Tip: You can also look for the plugin in the IntelliJ store and install it directly using the Browse Repositories… button. After installing, a new category of settings is available in IntelliJ IDEA. We use this area to connect IntelliJ IDEA to ALM Octane. In IntelliJ IDEA, choose File -> Settings -> ALM Octane Settings. You can now work with ALM Octane from within IntelliJ IDEA. On the bottom left, click and select ALM Octane. The tab for My Work opens, displaying work assigned to you, grouped by category. Use the checkboxes to in the My Work tab to filter which items you can see. When you start another session, the ALM Octane IntelliJ IDEA plugin remembers what you were working on last time, and opens tabs in the ALM Octane pane accordingly. You can use the buttons to refresh the display, and to expand or collapse the My Work categories. Tip: To indicate that you are working on a particular item, and associate code changes with the item, right-click the item in the My Work list, and choose Start work. When you are done, right-click and choose Stop work. Click to choose which fields to see. You can also choose None or All. These settings only affect you. When you start another session, the ALM Octane IntelliJ IDEA plugin remembers your field selection. To display the details of an item in ALM Octane, click the item name, which is a link. You can search the list of items in My Work. The search results are opened in a new tab. The search runs in the scope of the current IntelliJ IDEA project only. As you implement stories and fix defects in IntelliJ IDEA, update your ALM Octane items. Gherkin tests can be initially created in ALM Octane, and then automated using IntelliJ IDEA. In My Work, right-click a Gherkin test, and choose Download script. 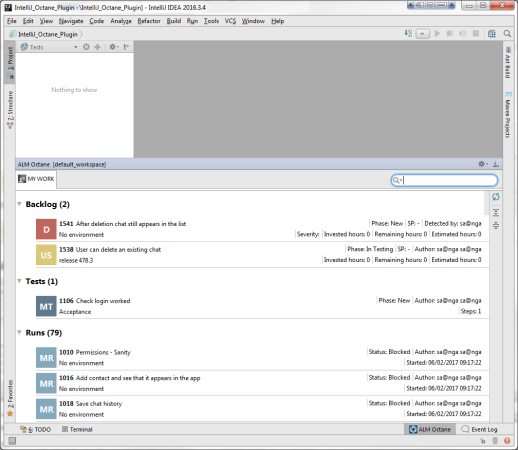 You can declare to the SCM system, such as Git, that you have started work on an item. You can commit changes for user stories, quality stories, defects, or tasks. In My Work, right-click a user story, a quality story, a defect, or a task and choose Start work. A triangular "play button" appears on the icon for the item. The item appears as a button in the toolbar in IntelliJ IDEA. You can click this button to open the item's details in a tab. In My Work, right-click a user story, a quality story, a defect, or a task and choose Copy Commit Message. Alternatively, you can also click in the toolbar in IntelliJ IDEA. Tip: You do not have to "start work" to copy the commit message. For details about editing commit messages, see Track changes committed to your Source Control Management system. A notification appears to let you know that the commit message has been copied to the clipboard. You can paste it into your Source Control Management (SCM) system. If you chose to Start work, click Stop work in the toolbar in IntelliJ IDEA.